A moisture analyser or moisture analyzer balance can be a portable or fixed moisture meter for moisture determination according to an established moisture measurement principle. Used in agriculture, food processing, biomass, pulp and paper, pharmaceutical, manufacturing, construction and other industries, PCE Instruments (PCE) professional-grade moisture analyzer products utilize renowned moisture measurement principles. For example, PCE halogen moisture analyzer balances function on the gravimetric or loss on drying (LOD) principle. A halogen moisture analyzer balance uses the heat from the halogen lamp or halogen light bulb to dry a material sample. Moisture content is calculated based on the weight difference before and after the drying procedure. The halogen-heated drying chamber of PCE moisture analyzer balances is suitable for moisture testing and analysis of samples of materials such as wood, pellets, biomass, granules, feed, food products, creams and pastes. In addition to desktop halogen moisture analyzer balances, PCE offers a wide range of handheld moisture analyzer devices for moisture determination on the go. 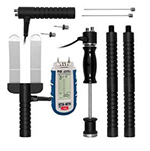 These portable moisture measurement devices are used in the field by building contractors, wood and concrete flooring installers, home inspectors, heating, ventilation and air conditioning (HVAC) technicians and more. Many of these handheld moisture analyzer products feature dielectric, capacitance or capacitive electrical resistance sensors or probes. Some moisture analyzer devices provide non-destructive moisture measurements, while other moisture analyzer products use insertion pins to penetrate a material's surface. PCE also carries inline moisture analyzer devices. Often referred to as in-process moisture sensors or real-time moisture meters, these inline moisture analyzers are integrated into existing process control systems. A noteworthy PCE in-process moisture sensor is the PCE-A-315, as the inline moisture meter provides exceptionally accurate grain moisture measurement in real time. The PCE-A-315 in-process moisture sensor boasts a measurement range of 5% to 40% for moisture content during continuous mass flow with an error of just ±0.5% from 5% to 18% grain moisture. In addition to remarkable precision, the PCE-A-315 inline moisture analyzer delivers significant cost savings. The PCE-A-315 lowers energy costs by enabling shorter drying times and reduces labor costs by automating the moisture monitoring process. Suitable for the continuous monitoring of moisture in corn, soybeans, wheat, rice, sorghum, barley, oats, rye, hops, coffee, cocoa beans, oil seeds, flax seeds, sunflower seeds, poppy seeds, pumpkin seeds, spelt seeds, buckwheat, sesame, peas, fava beans, scarlet runner beans, triticale, amaranth and jatropha, the PCE-A-315 in-process moisture meter uses low-power microwaves to penetrate the surface every 0.2 second and obtain interior moisture readings without causing any damage. An integrated temperature probe ensures the readings are accurate from 41°F to 131°F (5°C to 55°C). PCE-MA 110 is a halogen moisture analyzer that functions on the gravimetric or loss on drying (LOD) principle. The moisture analyzer uses the halogen method to dry the material sample. Moisture content is calculated based on the weight difference before and after the drying procedure. Calibration of the moisture analyzer can be performed at any time using the automatic calibration function and the included 100 g weight. PCE-MA 202 is an oven-drying moisture analyzer for weighing and heating material samples to determine moisture content. The heating chamber is heated by halogen lamps up to 199 °C. In this chamber, the moisture analyzer or moisture balance dries the sample to be weighed, and then calculates the moisture content from the weight difference. PCE-MA 100 is an oven-drying moisture analyzer for weighing and heating material samples to determine moisture content. The heating chamber is heated by halogen lamps up to 199 °C. In this chamber, the moisture analyzer or moisture balance dries the sample to be weighed, and then calculates the moisture content from the weight difference. The Multifunction Moisture Analyzer PCE-MA 200 is used to weigh a range of substances up to 200g / 7.05oz and measure their moisture content. A halogen lamp heats up the chamber to 199 °C / 390 °F. The multifunction moisture analyzer dries the substance to be weighed within the heating chamber and determines the moisture content from the difference in weight. The moisture analyzer PCE-MA 50X is an innovative solution for the fast and highly accurate determination of moisture in a wide variety of materials. The precision weighing scale uses weighing technology from the analytical balance range and is operated in combination with a drying chamber. PCE-SMM 1 is a soil moisture analyzer ideal for use in agriculture, crop science, horticulture, botany, landscaping, gardening and environmental testing applications. This portable handheld moisture analyzer or meter measures soil moisture or humidity quickly, easily and accurately. The Hay Moisture Analyzer PCE-HMM is a professional device to designed to determine moisture and temperature of pressed hay and straw. The Hay Moisture Analyzer features a sensor made of stainless steel, which can be purchased in four different lengths, while the wooden handle has an ergonomic design. The Hay Moisture Analyzer PCE-HMM proves to be extremely robust, designed to withstand applications for many years. PCE-MMK 1 is a portable handheld digital moisture meter used to measure the moisture content of wood, paper, textiles, concrete and other building materials. This multifunction moisture analyzer also measures ambient temperature and ambient relative humidity. PCE-WMH-3 is a portable handheld digital moisture analyzer used to measure the moisture content of wood. This hammer-style wood moisture analyzer features preset characteristic curves for measuring moisture in 270 different wood types. PCE-WP24 is a wood moisture analyzer or meter used to perform noninvasive, nondestructive moisture measurements of wood, timber and other construction or building materials. An ideal tool for assessing everything from lumber to floors and more, this moisture meter uses electromagnetic waves that penetrate approximately 50 mm / 1.96 inches to 60 mm / 2.36 inches deep (depending on substrate) to return a mean-value moisture content percentage. PCE-PEL 20 is a portable handheld digital moisture analyzer used to measure the moisture or water content of pellets and biomass such as sawdust, wood chips, straw, hay, sunflower shells, buckwheat, corn and soy. Designed in collaboration with biomass power plant operators, this pellet moisture analyzer features automatic temperature compensation. PCE-WM1 is a multi-function air moisture analyzer used to determine relative humidity (% RH), absolute humidity (g/m³), air temperature, dew-point temperature and surface temperature (°C). This Metric-only measuring instrument comes complete with an external sensor probe for taking the surface temperature of different materials. A moisture analyzer is an essential measuring tool for use with products and materials affected by humidity and water. In fact, moisture plays a key role in the strength, storage, safety and monetary value of many different products and materials. In the construction industry, the moisture content of building materials such as wood and concrete is measured to assess structural integrity. In the food processing industry, laws regulate the amount of water or moisture present in certain food products. The cost of a food product can be impacted by moisture, because water adds weight and some foods are priced per pound, kilogram, etc. In addition, to prevent microorganism growth within the foods themselves, moisture content is monitored carefully by food scientists and food safety professionals. Moisture also can influence the overall taste and texture of a food product. Thus, to guarantee a stable production run resulting in a high-quality food product, moisture is measured at several points throughout the food production process, including but not limited to the inspection of incoming ingredients, inline moisture monitoring using fixed-installation moisture sensors, and offline quality assurance laboratory tests. The more important water or moisture content is to a product or material, the more accurate the moisture analyzer should be. For example, a desktop halogen moisture analyzer is both a drying oven and an analytical balance used to measure to a high degree of accuracy the weight of a sample before and after drying. Ideally, a halogen lamp moisture analyzer should offer an accuracy of 0.01 % and a resolution of 0.01 g or better. However, when measuring the moisture content of a concrete slab, this level of accuracy is not necessary. Instead, a moisture analyzer designed to measure the moisture content of concrete might display a percentage or another indicative value based on a unified scale (e.g., 0 ... 200). The higher the percentage or indicative value, the higher the moisture content. An indicative value serves to identify moisture tendency for comparative (before / after) measuring purposes. For example, you can assess the moisture of the slab immediately after the concrete is poured, and then assess the moisture again after some time has passed to evaluate the concrete drying and curing process. 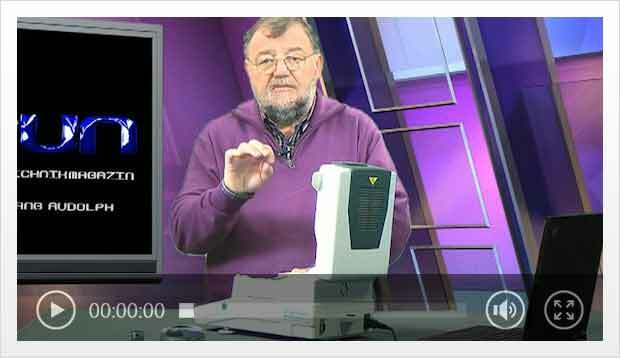 Another factor vital to the selection of a moisture analyzer is the type of material to be measured. The majority of moisture analyzer products are designed to determine the moisture content of a specific material. A wood moisture analyzer might be designed not only to measure wood, but also to measure wood from particular tree species. 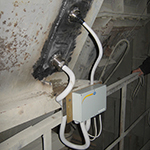 In addition, the measurement method employed by the moisture analyzer should be taken into account. If you cannot damage the sample or material, then you should choose a moisture analyzer that uses a non-destructive measurement method such as capacitive- or microwave-based moisture determination. In contrast, the moisture content of samples or materials that can be damaged can be measured using a moisture analyzer that employs conductivity-, resistance-, kiln-, gravimetric- or loss-on-drying-based measurement principles. 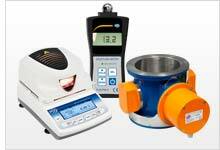 Different moisture analyzer products use different moisture measurement principles. Therefore, one must evaluate the technical specifications of a moisture analyzer carefully prior to purchase to ensure compatibility with the intended practical application. To assist you in your purchasing decision-making process, the technical staff at PCE Instruments (PCE) put together the following table and explanation of the four main moisture measurement principles used by PCE's moisture analyzer devices. The capacitive moisture measurement principle relies on the dielectric permittivity of the material or sample. A moisture analyzer device that uses capacitive moisture detection features a dielectric sensor probe that is placed on the surface of the material to be measured. The dielectric sensor probe of the capacitive moisture analyzer device emits an electric field. The moisture analyzer device then measures the electrical capacitance and converts the data to an indicative moisture value or percentage based on preset material-specific characteristics. Thus, a capacitive moisture analyzer is material dependent, as different materials and compositions have different electrical properties. In addition, the depth of the material sample must be taken into account, as the electric field emitted by the dielectric sensor probe will penetrate the surface to a depth ideal for obtaining accurate capacitive moisture measurements in the designated medium. This non-destructive measurement method is recommended for taking comparative (before / after) moisture measurements to identify the tendency of a material such as paper, textiles, soil, wood, concrete and other building materials. Conductivity- or resistance-based moisture measurement also relies on the electrical properties of the material to be measured. However, a conductive sensor probe with two contacts must be inserted into the surface of the material, so this measurement method is destructive. After the two contacts penetrate the surface, the conductive sensor probe emits an electric field. The moisture analyzer device then measures the electrical resistance between the two contacts and converts the data to an indicative moisture value or percentage based on preset material-specific characteristics. Thus, a conductive moisture analyzer is also material dependent. This destructive measurement method is recommended for taking moisture measurements of material samples that can be damaged. It is important to note that each material naturally has different conductivity properties. These properties or characteristics can change when a material is subjected to different processes. For example, the wetter a material becomes, the lower the resistance becomes. Therefore, the characteristics of a sample should match the characteristics of the material after processing. If the characteristics do not match, the moisture measurement values will not be accurate. In addition, the preset material characteristics saved by the conductive moisture analyzer must match the characteristics of the sample. If the characteristics are not stored, a measurement is still possible, but in this case, the measurement should be used only for assessing moisture tendency. The gravimetric moisture measurement principle, also referred to as thermogravimetric moisture measurement, employs one of the most exact methods available for moisture determination. It also provides a lot of flexibility, as gravimetric moisture measurement is not material dependent. This means that no material characteristics or presets must be saved by the gravimetric moisture analyzer. Instead, gravimetric moisture measurement relies on sample weight. To begin, a sample is weighed with a precision balance. The sample is then dried and weighed repeatedly until the sample shows no fluctuation in weight. The sample's weight after the drying process concluded is compared against the sample's weight before drying. In addition, the weights recorded during the drying process are taken into account and a final moisture content or ratio for the material sample is obtained. The key is to heat the sample just enough so the material releases moisture without burning. Therefore, the temperature has to be adjusted to accommodate the heat tolerance of the sample material. These moisture analyzers, however, only supply measured values ​​after approximately 5 to 90 minutes. The actual drying time depends on the moisture content and size of the respective sample. PCE's halogen moisture analyzer balances make the gravimetric moisture measurement process as simple and convenient as possible. These halogen moisture analyzer balances consist of two main components: a built-in precision balance and a drying chamber. The balance automatically registers the initial weight of the sample and monitors the weight throughout the entire drying process. If the built-in precision balance no longer determines a weight difference after taking several measurements, the drying process is terminated and the measurement data is recorded. This automated process offers a considerable time advantage compared to conventional kiln drying, during which at regular intervals a sample must be removed manually from a drying cabinet and weighed time and again. An additional advantage of PCE's halogen moisture analyzer balances is an integrated thermostat. This gives you the ability to easily adjust the temperature during the drying process. For example, a relatively wet sample can be dried in the initial phase at a higher temperature, because the higher moisture content prevents the sample from burning. The drying temperature then can be lowered over time, so that as the sample becomes more and more dry, the material does not burn. Once a drying process is conducted, the process can be stored as a program for repeat use, thus ensuring reproducible measurements. The measured data can be tracked in real time on the moisture analyzer's display or on the monitor of a connected PC and can be stored or printed for documentation purposes. Microwave-based moisture measurement is based on the dielectric properties of the material. Using an alternating electromagnetic field, a microwave-based moisture sensor monitors the moisture level of materials in process or production. Often called an in-process moisture meter or inline moisture sensor, a microwave-based moisture analyzer allows for non-destructive moisture measurements of many different kinds of materials including but not limited to grain, seeds, beans, legumes, waste paper, sludge, crushed stone, gravel, sand, concrete and liquids. The advantages of microwave moisture measurement are: real-time measurement, greater penetration depth, high measurement accuracy and the ability to maintain continuous, uninterrupted operation. This measurement method is used primarily in the industrial sector for the continuous monitoring of raw materials to be processed. Using this brief introduction to the primary moisture measurement principles employed by the moisture analyzer products found on this website, it should be possible for you to identify a moisture measurement system suitable for your particular application. However, if you have any questions, please don't hesitate to contact PCE's friendly and knowledgeable technical support staff at or +44 (0) 2380 987 035 for PCE Instruments UK, or or +1 (561) 320-9162 for PCE Americas Inc. We are happy to assist.